Reading and share top 13 famous quotes and sayings about Instigate by famous authors and people. Browse top 13 famous quotes and sayings about Instigate by most favorite authors. 1. "War should be made a crime, and those who instigate it should be punished as criminals." 2. "Unjust! - unjust!' said my reason, forced by the agonising stimulus into precocious though transitory power; and Resolve, equally wrought up, instigated some strange expedient to achieve escape from insupportable oppression - as running away, or, if that could not be effected, never eating or drinking more, and letting myself die." 4. "Peaceful disputes are maintained when men sincerely believe that they are morally, logically correct about the issues at hand. It is when neither side is really certain that wars are instigated." 5. "The Special Operations Network was instigated to handle policing duties considered either too unusual or too specialized to be tackled by the regular force. There were thirty departments in all, starting at the more mundane Neighborly Disputes (SO-30) and going onto Literary Detectives (SO-27) and Art Crime (SO-24). Anything below SO-20 was restricted information, although it was common knowledge that the ChronoGuard was SO-12 and Antiterrorism SO-9. It is rumored that SO-1 was the department that polices the SpecOps themselves. Quite what the others do is anyone's guess. What is known is that the individual operatives themselves are mostly ex-military or ex-police and slightly unbalanced. 'If you want to be a SpecOp,' the saying goes, 'act kinda weird..."
6. "Instigated by princes equally ambitious and less sagacious and more unscrupulous than he was, the people of India were persuaded that they might successfully rise against their English rulers, who had brought them out of a state of anarchy and constant warfare and misery, and had established peace and prosperity in their country. Their ignorance and gross superstition made them the facile tools of their designing chiefs." 7. "Very often, writing a song is a process that happens to me rather than one that I instigate. I feel a song coming on and, like a sneeze; I wait for it until it comes." 8. 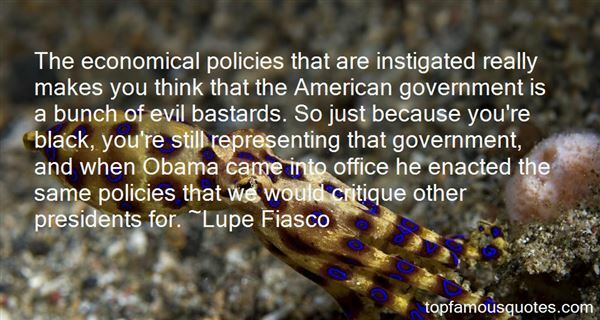 "The economical policies that are instigated really makes you think that the American government is a bunch of evil bastards. So just because you're black, you're still representing that government, and when Obama came into office he enacted the same policies that we would critique other presidents for." 9. "Lissa knelt down, compassion on her face. I wasn't surprised, since she'd always had a thing for animals. She'd lectured me for days after I'd instigated the infamous hamster-and-hermit-crab fight. I'd viewed the fight as a testing of worthy opponents. She'd seen it as animal cruelty." 10. "I own all the characters I created, thanks to the Writers Guild, so nobody can do anything without me. The way it works is: If the copyright owners instigate a project, like the movie, then I get a fee as creator. If I instigate a project, like the musical, I pay a percentage to the copyright owners." 11. "In the Garden story, good and evil are found on the same tree, not in separate orchards. Good and evil give meaning and definition to each other. If God, like us, is susceptible to immense pain, He is, like us, the greater in His capacity for happiness. The presence of such pain serves the larger purpose of God's master plan, which is to maximize the capacity for joy, or in other words, "to bring to pass the immortality and eternal life of man." He can no more foster those ends in the absence of suffering and evil than one could find the traction to run or the breath to sing in the vacuum of space. God does not instigate pain or suffering, but He can weave it into His purposes. "God's power rests not on totalizing omnipotence, but on His ability to alchemize suffering, tragedy, and loss into wisdom, understanding, and joy." 12. 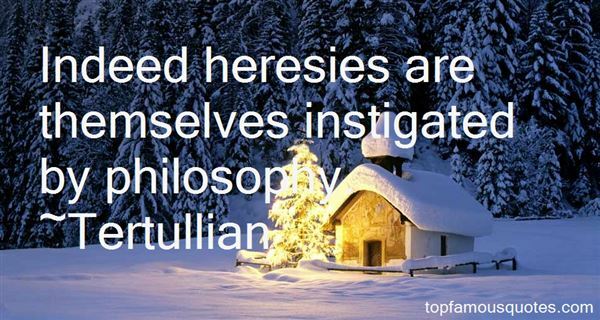 "Indeed heresies are themselves instigated by philosophy." 13. "I lied," I said. ..."I know it," he said. 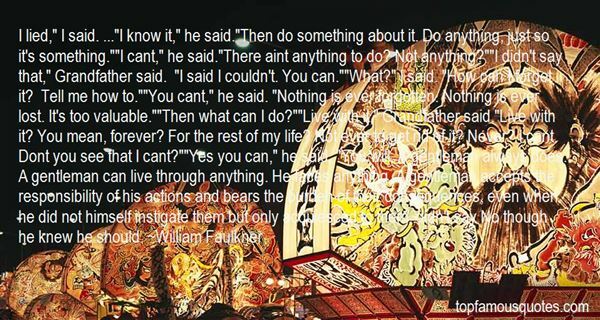 "Then do something about it. Do anything, just so it's something. ""I cant," he said. "There aint anything to do? Not anything? ""I didn't say that," Grandfather said. "I said I couldn't. You can.""What?" I said. "How can I forget it? Tell me how to. ""You cant," he said. "Nothing is ever forgotten. Nothing is ever lost. It's too valuable. ""Then what can I do? ""Live with it," Grandfather said. "Live with it? You mean, forever? For the rest of my life? Not ever to get rid of it? Never? I cant. Dont you see that I cant? ""Yes you can," he said. "You will. A gentleman always does. A gentleman can live through anything. He faces anything. A gentleman accepts the responsibility of his actions and bears the burden of their consequences, even when he did not himself instigate them but only acquiesced to them, didn't say No though he knew he should." It seems a universal rule in this world that people will always look for victims and scapegoats, does it not? Especially at times of difficulty and tension."